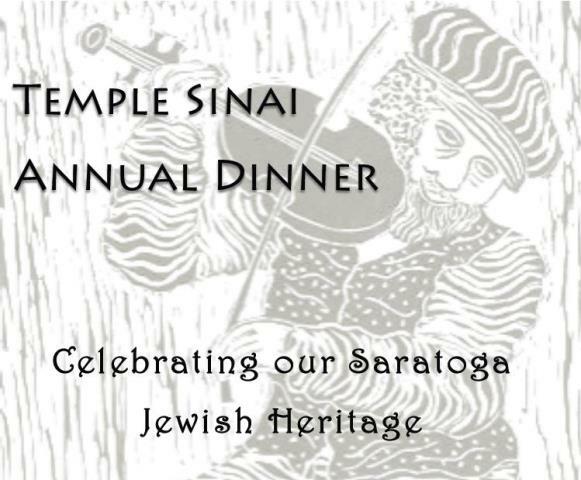 Join us at The Inn at Saratoga (231 Broadway, Saratoga Springs) on Sunday, June 5 (5-8pm) for the Temple Sinai Annual Dinner Gala. Honoring Rabbis Anna & Monte Sugarman with special recognition of the 30th Anniversary of Rabbi Linda Motzkin and Rabbi Jonathan Rubenstein. Volunteer of the Year Awarded to Wendy Zeh. The Mop & Bucket Co., the region’s premiere improv comedy troupe, will be performing at the Annual Dinner Gala. Featuring a Tour of the Historic Jewish Areas of Saratoga with Ellen Steinberger on June 5 (10-11:30am). Click here to RSVP for the tour ($5 donation if not attending the Gala, FREE if you are attending). No tour if raining.